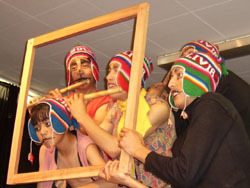 The Bolivian youth theatre group Teatro Trono from El Alto, the highest city in the world, return to Berlin in 2007 for the fourth time as guests of Gesellschaft für solidarische Entwicklungszusammenarbeit e.V. 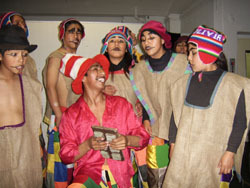 Teatro Trono began 19 years ago as a project with street children. Today it is at at the heart of the COMPA cultural and education centre which serves the local people. During their visit to Germany the group perform and share their experiences and theatre skills with young people in schools in Berlin and Oranienburg. Their tour is also designed to promote intercultural understanding as part of Kinderkulturkarawane 2007 www.kinderkulturkarawane.de. Share the joy of music, clowning and play with this potilically commited group of young actors. at Werkstatt der Kulturen, Wissmannstraße 32, Neukoelln, Berlin. A project of Gesellschaft für solidarische Entwicklungszusammenarbeit e.V. 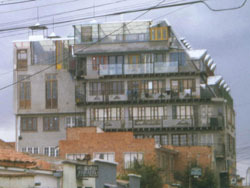 Berlin (GSE) and Comunidad de productores en artes (COMPA), El Alto, Bolivia.